We may not rely on our phones for actual calls as often we used to, but these fancy little rectangles of ours still handle more than their share of critical communication. From emailing clients to texting with colleagues, our smartphones keep us connected to business wherever we may roam. But the apps that come installed on devices by default aren't always the best options; in fact, they can often be flat-out disadvantageous when it comes to professional productivity. 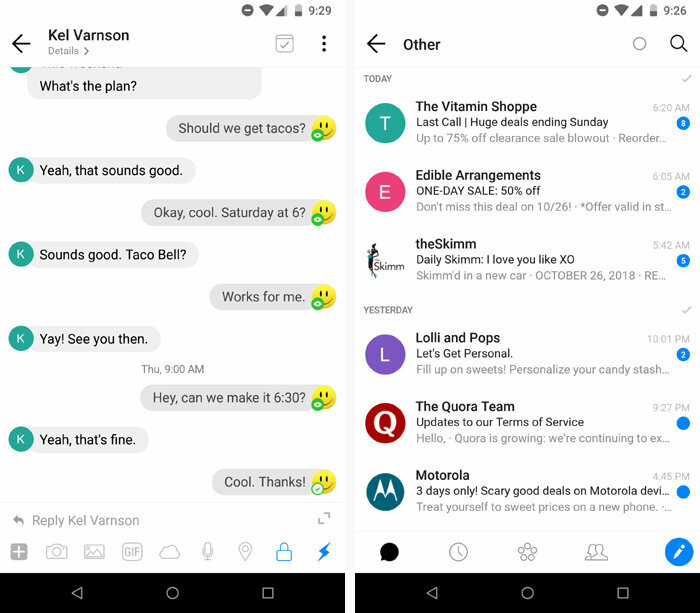 I've spent a fair amount of time testing the significant email and texting apps available on Android. These are the titles I'd recommend, broken down by category and purpose — and all free, unless otherwise noted. Google's Gmail app is both powerful and easy to use — especially if you also use Gmail on your computer. 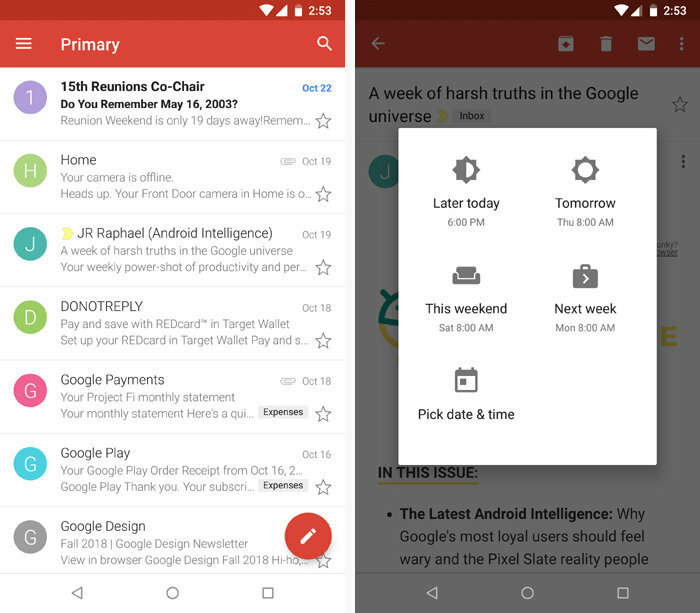 The Android app gives you the same basic inbox setup as the desktop site, complete with all the categories, labels, and other designations you're accustomed to seeing. It taps into Gmail's handy snoozing system, too, and generally just gets the job done with minimal fuss or adjustment required. The Gmail Android app provides a familiar interface and set of features for anyone used to the Gmail website. And though it's called Gmail, the Gmail app can work with any type of email account or even multiple email accounts — whether they're associated with Google, Microsoft Exchange, or any webmail provider or company server. 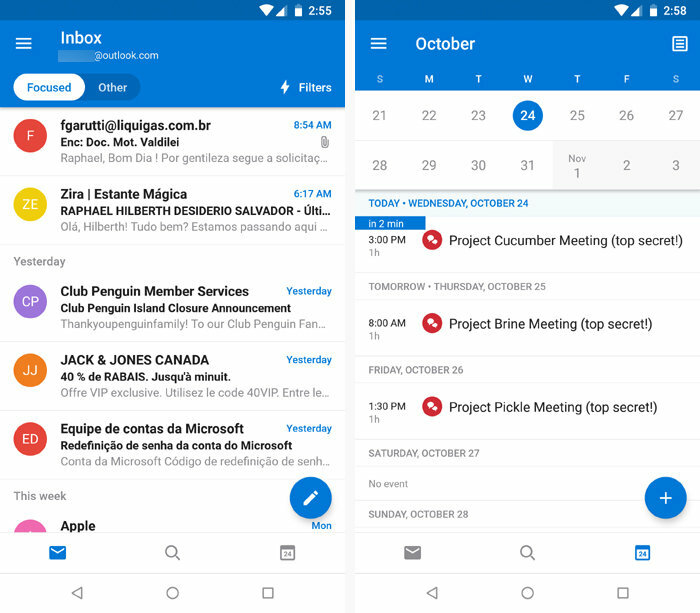 Whether you use Outlook on your computer or are just immersed in the Microsoft ecosystem in general, the Outlook Android app will make you feel right at home handling email from your phone. Outlook for Android provides an attractive interface with Microsoft's Focused inbox configuration, in which emails are sorted into either a primary tab, if they're deemed worthy of your immediate attention, or an "Other" tab, if they're determined to be unimportant. Like its desktop counterpart, the app even offers integrated access to any calendars associated with your accounts. Outlook provides a commendable mobile environment for anyone invested in Microsoft's ecosystem or products. The Outlook Android app doesn't have to be only for Microsoft accounts, either; it can handle external email accounts — from any webmail provider or company server — in addition to or instead of a standard Outlook.com address. When it comes to truly secure email communication, ProtonMail is the program you want. It uses an open-source form of end-to-end encryption that allows your messages to remain inaccessible to everyone but your intended recipient — and, if you wish, even inaccessible to that person, if he or she doesn't open your missive within a specified amount of time. 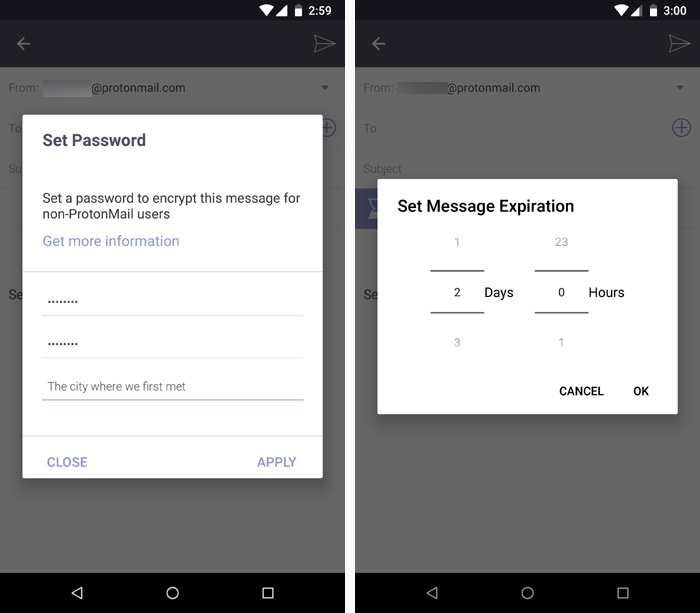 ProtonMail gives you everything you need to keep your messages private and secure, including password-based encryption and message expiration dates. The company behind the app is as serious as can be about privacy: You're not required to provide any personal information upon signing up, the service doesn't store any IP addresses or identifying data, and the servers are hosted in Switzerland in order to keep them out of U.S. and European Union jurisdiction — so that even if prosecutors for some reason wanted to get their hands on your data (and don't worry, I won't ask why), they'd have a tough time doing so as a result of Swiss privacy laws. The service doesn't require your recipients to use ProtonMail. If you send an encrypted message to a regular email address, you simply set a password and provide a hint that only your recipient would understand. He or she will then receive the hint along with a link to decrypt the message. You can also just send regular, unencrypted emails like you would in any other email client. ProtonMail is free with certain limitations — you can use only a single email address, 500MB of storage, and three folders for your messages. Paid plans that raise those restrictions and add in other advanced features, including the ability to use your own domain, start at US$55 a year. In many ways, email can feel a little stale compared to the more modern collaboration tools so many of us now rely on. A brand new app called Spike (which evolved from an existing app known as Hop) aims to fix that by taking the modern messaging feel and features of apps like Slack and bringing them directly into your inbox. The result is a completely reimagined take on what email ought to be. For individual, person-to-person messages, Spike strips away all the standard email stuff and makes a thread look like a conversation, just like you'd experience in any instant messaging app. You can see when the other person has read your latest message — and if that person is also using Spike, you'll see indicators showing when they're typing, too. Any conversations that aren't personal in nature — low-priority emails like purchase receipts, newsletters, and social media updates — get placed in a separate "Other" tab that's visible from your main inbox view but separated enough to avoid being a distraction. Spike makes it easy to create multi-person group threads, which look like Slack channels to you and anyone else using Spike and act like regular cc-centric emails to anyone else involved. With companion apps available for Windows, Mac, and the web, it really has the potential to change the way you think about email all throughout your day. Spike is free for personal use, with a limit of 100,000 searchable messages and 10 active group chats, or US$72 per user per year for limit-free business-level accounts. Upgrade your Android texting experience with Pulse, a thoughtfully designed service that'll make you wonder how you managed with your phone's default SMS app all this time. Pulse makes it simple as can be to send and receive messages from any device or set of devices you use, including desktop computers (via its web interface, Chrome app or extension, and native Windows and Mac apps) and other Android devices. It also keeps your messages securely backed up and synced so they're always available anywhere — even when you change phones or reset your current phone. Beneath its surface, Pulse is overflowing with useful features and opportunities for customization. You can even set it up to automatically reply to messages with a prewritten response whenever you're driving, while you're on vacation, or anytime an incoming message contains a certain keyword. Pulse is packed with powerful features and opportunities for customization. Pulse is free for single-device use. If you want to access the service from multiple devices and have your messages backed up and synced, you'll have to pay US$1 a month, $6 a year, or $11 for a lifetime subscription. Need extra privacy for your text-based discussions? Just like ProtonMail does with email, Signal brings reliable encryption into the realm of texting. Anytime you're chatting with another Signal user, the open-source service will secure your conversation with end-to-end encryption and without any of your data being stored on remote servers. The app also offers encrypted voice and video calling between Signal users. 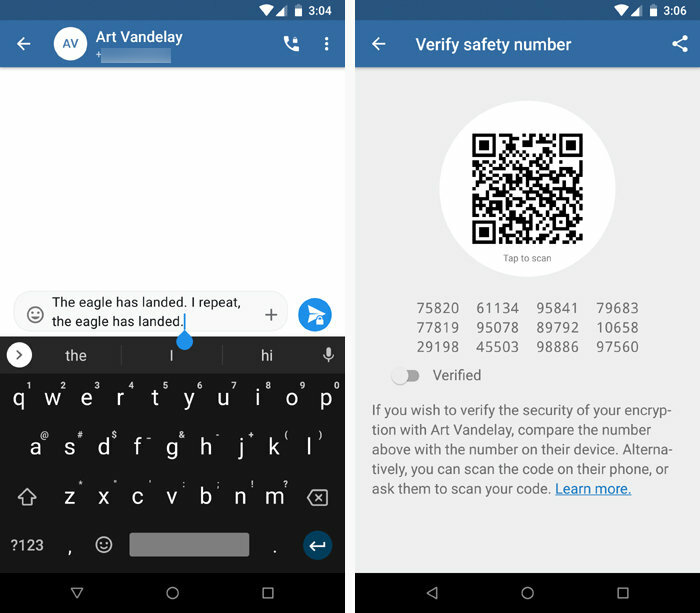 From automatic encryption to secondary forms of verification, Signal takes security seriously. 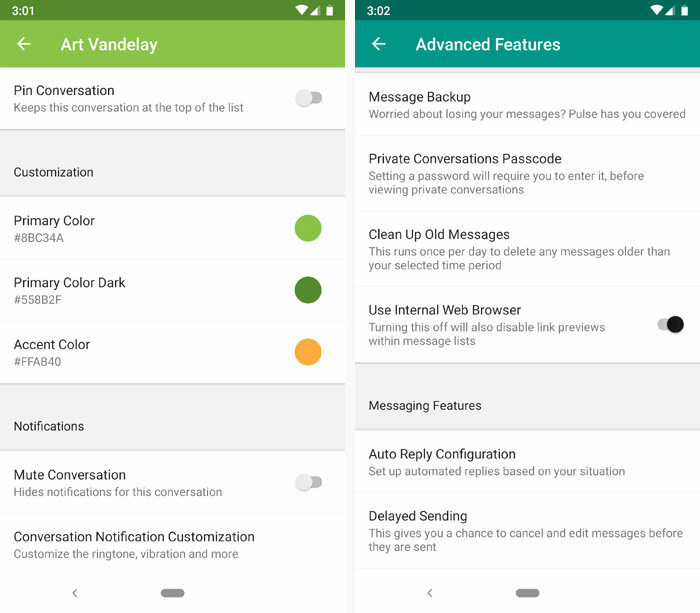 If you're texting with someone who doesn't use Signal, the service will alert you that the conversation is unsecured and then act like any other SMS client. Need more Android app recommendations to flesh out your mobile productivity powers? Check out my collections of the best office apps for Android, the best travel apps for Android, and the best Android widgets for busy professionals next.